Merapi volcano spews smoke, taken from Umbul Harjo village in Sleman, Yogyakarta on early October 26, 2010. 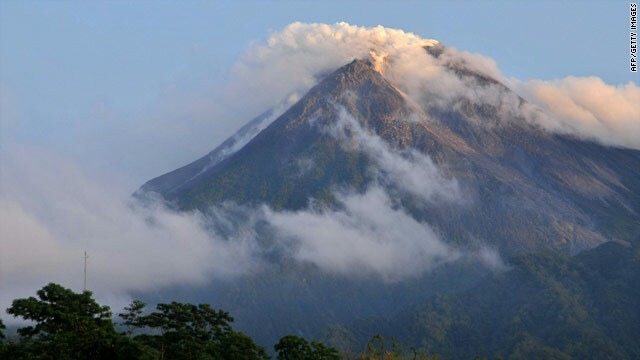 Indonesian media reported that 15 people were killed, including some journalists who were staying in a guesthouse to get close to the volcano. CNN could not independently verify those reports. Christian Awui, a rescuer at the scene, told CNN that the first thing that residents heard were sirens from an early warning system announcing the coming eruptions. "There was panic," he said. "You could hear the rumbles of the volcano." People ran to a refugee camp about 4 kilometers (2.5 miles) away. Because it was still dark, it was hard to tell how the eruptions compared with previous ones, Awui said. Some nongovernmental relief agencies were poised to offer immediate help. One of them was World Vision Indonesia, a Christian relief and development agency. "Right now, our biggest concern is the children," said Fadli Usman, World Vision Indonesia's rapid assessment team leader. "Children are always forgotten in the early moments of a disaster like this. My first task will be to assess the needs of the children and their families in the evacuation centers so our team can begin to help them." Usman said about 1,500 people -- mostly women and children -- had found refuge at a four-building shelter about 7 miles (12 kilometers) from the volcano. The evacuees, he said, are worried about the men who stayed behind to guard their homes and fields on the mountain. A dusting of ash covered motorbikes and cars at the shelter parking lot, the relief worker said. The heavy ash fallout also obscured any view of the mountain from his location, he said. Usman had reported earlier that traffic was heavy as people left the region near the mountain. The traffic was not chaotic, he said, and the road was open and under control. CNN's Brian Walker contributed to this report.